In the beginning the South Africa interested me just for one tourism object – penguin colony near the Bouldersbeach, now there’s one more relevant aspect – wines. Although winery traditions are not as old as they are in the good old Europe, nowadays South Africa has taken relevant place and makes out approximately 3% of total wine marker in whole world. 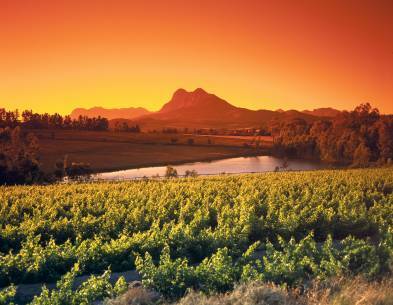 Approximately from all its sides South Africa is laved by oceans, which more or less, but still affects wine taste, gets it unique and different. In Larisa independent wine courses we tasted 2 white wines and 4 red wines from 2 South African regions Stellenbosch and Paarla (look at map in image gallery). Although looking from amount share-out white wines in South Africa are dominating with Chenin Blanc, Chardonnay, Sauvignon Blanc grapes and vanilla, green apple, gooseberry, fried bread, melon, peach, passion fruit and pineapple wine bouquet. Sauvignon Blanc Vergelegen Stellenbosch 2009 together with green crunchy salads, added pear, goat cheese. We continue to characterize them after three main clauses: its look, aroma and taste. Bright green-yellow color, thick wine “curtains”, in aroma – green gooseberries, green pepper, in taste – oiliness, high sour level, citrus. Association – misty, wet and cloudy summer morning. Glen Carlou Quartz Stone Chardonnay 2008 held out 11 months in oaken barrels. It has goldy color. In aroma, there are mellowed peach, roasting, typical Chardonnay notes. Very good fitted with chanterelle mushroom-chicken Kishi. Glen Carlou Pinot Noir 2008 – dark red color. In taste and aroma there are dark cherries, although roundishness and tannin don’t disturb. Simonsig Redhill Pinotage 2007. About Pinotage wine we need to talk a little bit finer. It is made from grapes, which were grown in South Africa, crossing Pinot Noir and Cinsaut sorts. By the way, Cinsaut in this country were known with name Hermitage, so from this has come Pinotage name. In the begging, because of not so good technology, wine from this sort didn’t stand out not with unique taste, not with aroma, and that’s because why it was made less and less each year. So it continued till wine producer households like Kanonkop and Vriesenhof began to use special methods so from this sort could get really good and high quality wine. Now Pinotage grapes are counted as South African pearl. From they made wine, has saturated elegance, grape aroma and sweet-and-sour taste. Wine has been kept in new oaken barrels and it has dark, saturated red color. Over matured aroma, in taste there are raspberries, can feel tannin, but isn’t heavy. Plaisir de Merle Cabernet Sauvignon 2006 – brown-red color, in aroma red fruit aroma, it’s hard to tell, in taste there shows dark chocolate taste, there are tannins too. If I should choose, then Plaisir de Merle gold winged lion saw on 2008 Chardonnay bottle. Glen Carlou Syrah 2005 –wine kept oaken barrels for 12 months. Dark red color, in aroma there are herbs, dried fruits. Wine with character, tannin. Storing potential is till 10 years. Subjective – I didn’t choose it.